When I was planning my wedding, many moons ago, I wanted to make my handmade invitations special from the envelope right down to the response card. So, on top of using pretty love stamps, I thought it would be extra fun to have the invites mailed from a place with a Valentine-y name since our date was Feb. 15th. I jumped online and started researching and was soooo excited to find out there is a town named Valentine way, way, way over in West Texas! Can you believe it? 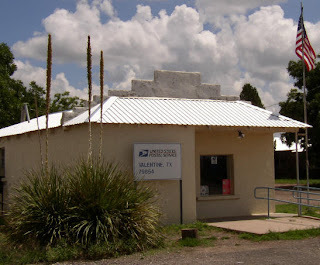 I quickly called the postmaster, a kind lady named Maria, who was more than gracious about my request to hand stamp 300 wedding invitations. So, I bundled them up and sent them on their way to Love Station. When my parents' invitation arrived, I was so excited to see how the stamp turned out...it was perfect! Not only did Maria hand stamp them and handle them with care, but she also sent us a wedding card of congratulations! Later, I thought it would be fun to have a special invitation sent to me on my actual wedding day. So, I sent one with a thank you note to Maria for all her help. Sure enough, my very own invitation was waiting for me when we came back from our honeymoon. 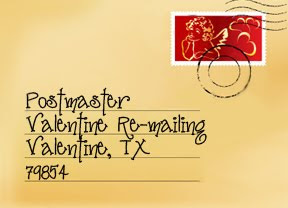 This time, it had the cutest Valentine postmark in red ink! It turns out, the little town receives about 15,000 cards every year to be stamped with a specially designed Valentine's Day stamp and Maria and her assistant handle each and every one. 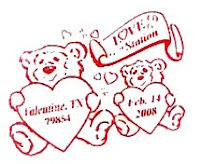 I think their special postmark is more unique than other Valentiney cities because each year, there is a contest among students in the tiny town (population 200, yeeeee haw) to design the coveted stamp. I imagine the kids thoughtfully drawing their lovely designs in a one-room schoolhouse like Little House on the Prairie. I know, it's bad but I can't help it. Just don't tell Maria. To make sure you don't miss out, mail your cards pronto. Also, remember to choose a Valentine with a light-colored envelope so your fancy stamp will really stand out. While you're at it, include a little Valentine for Maria, I'm sure she'd love it! Click here to check out a listing of some of the country's most romantic postmasters just waiting to add their own extra special touch to your Valentines. That's so cute. You're the cutest, can you just plan my life?